Town with 120,000 inhabitants, seat of county Szabolcs-Szatmár-Bereg, 230 km from the capital. 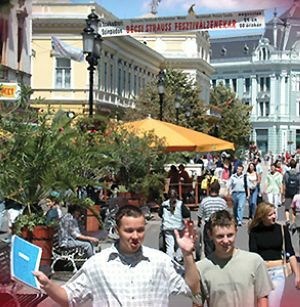 If you have not been to Nyíregyháza for a long time, you will be amazed to see how dynamically it changed: it has busy cultural life, nice parks, beautiful statues, buildings and friendly cafes. The only 200-year-old town has important architectural values such as edifices built in the styles of the turn of the 19th and 20th centuries as well as modern buildings. Outstanding examples are the eclectic County Hall designed by Ignác Alpár, the Korona Hotel, the Lutheran School and the Zsigmond Móric Theatre. The most valuable monument of the town is the baroque Lutheran church. The atmosphere of the main square is determined by the eclectic Town Hall, the statue of Kossuth, the Savings Palace and the neo-Romanesque Roman Catholic church with two towers. Its art nouveau buildings are significant: the Nyírvíz Palace, the Agricultural Savings Bank, the former Bristol Hotel, the Greek Orthodox Episcopal Palace. The masterpieces of the present time are the Zoltán Kodály Elementary school, the new wings of the College of Nyíregyháza and the Zsigmond Móricz County and Town Library. 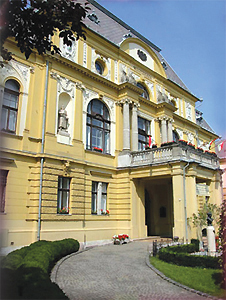 The relics of the past are preserved in the András Jósa Museum and at the Kállay collection. 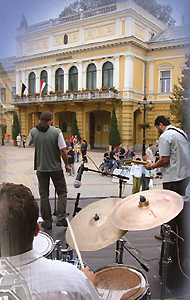 The town is famous for its medicinal bath, its friendly resort is Sóstógyógyfürdő. 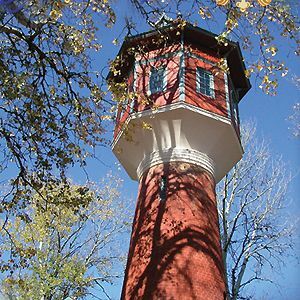 In the town you can also find the largest and the richest Zoo park in the country, as well as the only open-air museum of North-East Hungary, the Museum village, the Krúdy Vigadó serving as a significant programme centre. The Park bath, the Lake bath, the Bath house and the latest attraction of Lake Sós, Aquarius aquapark offer excellent relaxation and recreation. A small sightseeing train called Csi-hu-hu attracts many children, the omnibus evokes the one-time tram but you can visit the neighbourhood by rented bicycles or pedal cars, too. Water bikes and boats are available on the lake. From the look-out tower you can enjoy the nice panorama. Sóstófürdő, which has the atmosphere of untouched nature, is situated a few kilometres from the town centre of Nyíregyháza. It is a popular resort. There is an open air bath, a boating lake, medicinal thermal water, a bath formed on the lake and there are beautiful buildings in wonderful woody surroundings. The Zoo park of Sóstó, where most of the animals live freely, without cages, is known all over Europe.The Sóstó (Saline Lake) Museum, one of the largest outdoor village museums in Hungary, presents folk architecture of the regions in an area of 12 acres.